Were Thomas Kirk, my fifth great-grandfather, and Mary (Kirk) Geiger siblings? I believe DNA has finally given me an answer. Name: Given my extensive research into Thomas Kirk, any Kirk who crossed his path or simply toe-tapped into his proximity was an immediate person of interest and required a full-fledged investigation. Naturally, when Mary Kirk, who married Anthony Geiger in 1797 in Martinsburg, Virginia (now West Virginia), appeared in the same Ohio neighborhood, the sleuthing commenced with an excited fury. Age: They shared a close proximity in age. Born in 1778 in Virginia, Thomas was just four years younger than Mary who was born in 1774. Time and Space: They both lived in the same geography and timeline. Tax records confirmed that Thomas, my fifth great-grandfather, was in Licking County, Ohio by 1805. Meanwhile, a 1901 biography of Mary's grandson Richard Geiger, recalled that "In 1804 he [Mary's husband Anthony Geiger] came to Ohio, the year following the admission of the state into the Union, and located in Licking County..." Mary was even buried in the same cemetery as Thomas. Only a few yards separate them in their eternal rest. Although these facts coalesced around my theory, there was still no explicit evidence of a family relationship. What, if anything, could DNA tell me about their possible connection? The first challenge with autosomal DNA is that the genetic material inherited from a given ancestor fades with each subsequent generation. As a result, the strength of autosomal DNA matching only goes back about five, six or maybe seven generations. To put this another way, consider approximately how much DNA we inherit from each preceding generation: 50% of our DNA came from our fathers and the other half from our mothers. Jump back another generation, and we've inherited 25% of each of our grandparents' DNA. As you climb back each generation, the average amount of inherited DNA decreases by half. The further back you go, the numbers slim proportionally until the DNA is virtually indiscernible. 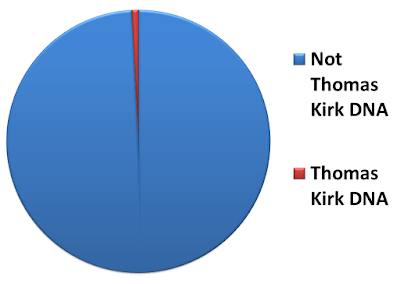 Exactly how much of Thomas Kirk's DNA should I have? As a fifth great-grandson, I could expect to share less than 1% of his DNA (0.78% to be exact). If we were to graph my DNA, Thomas would represent a slim sliver. Of course, DNA is rarely that straightforward. The process is further complicated because we don't necessarily inherit DNA from all of our ancestors at this distance. 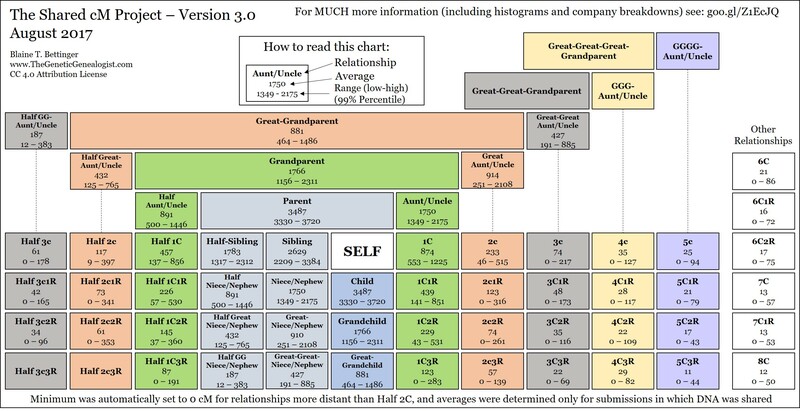 For a more detailed explanation on this quandary, I defer to genetic genealogist Roberta Estes who has addressed this issue in her blog Ancestral DNA Percentages - How Much of Them is in You. Mindful of the pittance of autosomal DNA that I've inherited from Thomas, I'm fortunate to have a first cousin twice removed - two generations closer to Thomas than me - who tested her autosomal DNA. As a third great-granddaughter of Thomas, she's inherited approximately 3.12% of his DNA. More DNA, of course, means increased odds for matching genetic Kirk cousins. Could we link her to any of Mary (Kirk) Geiger's descendants? 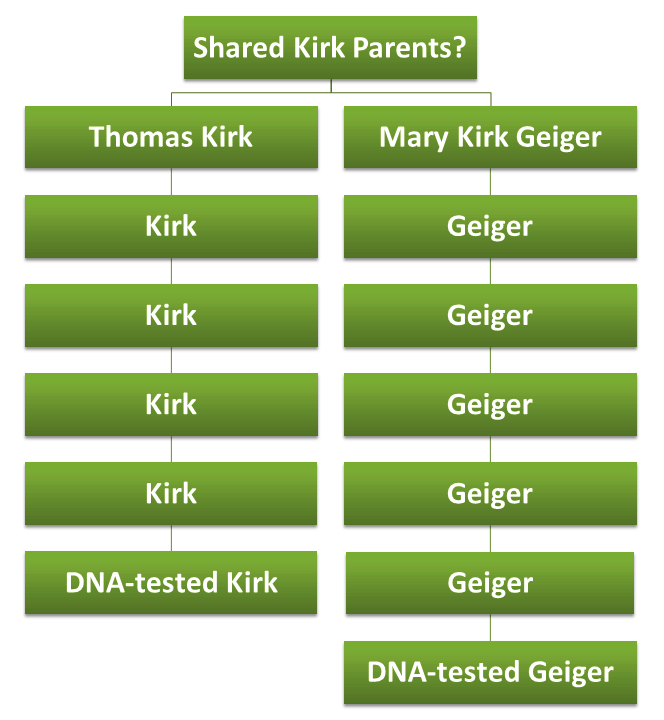 I searched my Kirk cousin's DNA matches for the surname Geiger and found six individuals who had a pedigree that traced back to Anthony and Mary (Kirk) Geiger. 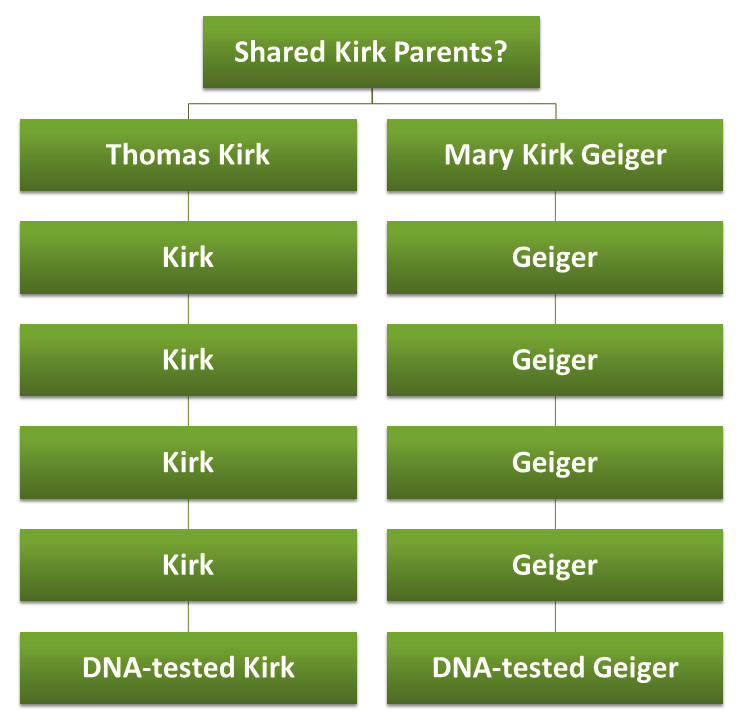 At first blush, it seemed there was indeed a genetic relationship between descendants of Thomas Kirk and Mary (Kirk) Geiger. 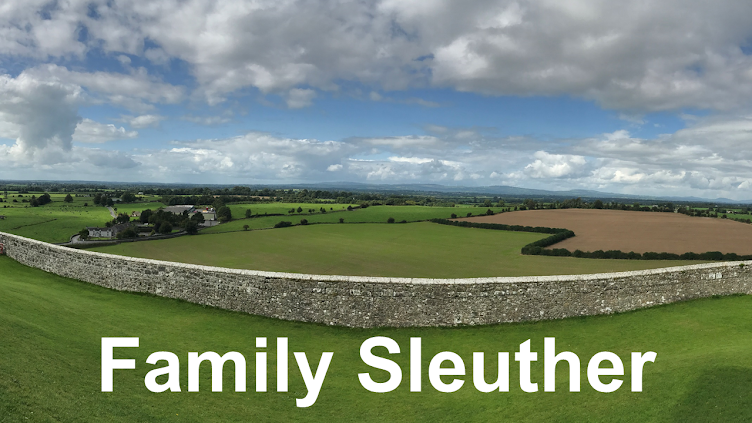 My next step was to evaluate the accuracy of these six genetic matches, and determine whether the amount of shared DNA corroborated a sibling relationship between Thomas and Mary. I do this by making the assumption that Thomas and Mary were siblings and calculating the descending relationships between my Kirk cousin and her Geiger matches accordingly. Next, I examine how much DNA each match shares and whether this falls within the verified range for similar family relationships. To make this assessment, I rely on The Shared cM Project, an invaluable tool developed by genetic genealogist Blaine Bettinger. Bettinger has polled an enormous number of DNA testers and their known relationships to determine the average amount of centiMorgans (a DNA measurement) an individual could expect to share with cousins at various levels. The expansive chart details both the average amount of centiMorgans (cM) common for a particular relationship as well as the range of cM that exists for that particular relationship. According to the Shared cM Project, fifth cousins share, on average, 25 centiMorgans (cM), but the amount of shared DNA can range anywhere from 0 to 94 cM. So, where do each of those four 5th cousins fall? While there is some variation among the four and none individually match the average, all fall well within the range that you would expect to see for a fifth cousin relationship. The average cMs for these four is 24.75 - a near exact match to the fifth cousin average. Again, the shared DNA falls within the established ranges we could expect to see for fifth cousins once removed. Six people who descend from Mary (Kirk) Geiger are genetic matches to a descendant of Thomas Kirk. The amount of shared centiMorgans between them all supports the claim that they are fifth cousins (or fifth cousins once removed), which in turn indicates that Thomas and Mary were siblings. This is, of course, assuming there's no other shared ancestry between the matches, which would skew my results. To my eye, there is no other obvious overlap in the family trees. While the evidence doesn't contradict my theory, I do recognize that the cM range for these distant family relationships are quite expansive. The shared cMs for the six cousins could just as easily be used to indicate a 6th or even 7th cousin relationship, putting another generation or two between Thomas and Mary. But what's the likelihood that six matches would show up for a single 6th or 7th cousin relationship? All of these matches are in the largest DNA database in the family history market, which means there's currently no access to additional tools like a chromosome browser to further scrutinize the connections. 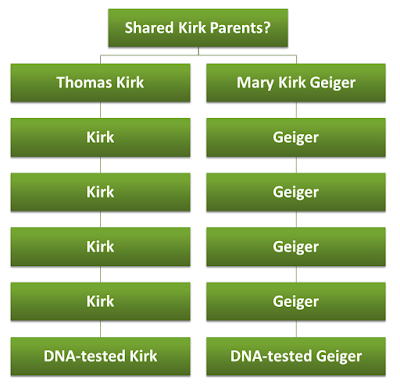 How else could I leverage these matches to determine definitively - should that be possible - that Thomas Kirk and Mary (Kirk) Geiger were brother and sister? In the meantime, I'm increasingly confident that Thomas and Mary were siblings. This fascinates me, and I wonder if I can use it to solve a mystery in my own tree. Thanks for writing about this. Let me know if you give it a try and what kind of results you get. Good luck! I have just the mystery to apply this to. Thanks! Good luck, Laura! Let us know how it works out. Excellent post and easy to follow. I read this with great interest as I have a similar "Who's your sibling?" case. I assume all of the matches' trees have been confirmed out to the Kirk or Geiger ancestor, but are all other branches of the trees also known? Do the cousins with over 20 cMs show up in the Shared Matches list of the other matching cousins? It would be so interesting to see if the shared DNA is coming from the same segment of a chromosome for one and all. It is a shame this company has no interest in including a chromosome browser in their repertoire of tools. Thank you, Cathy. I appreciate it. You raise a couple important points: several of the trees are fully fleshed out, but I've taken them at their word and not validated the accuracy of their research. There are a couple with family lines left to be confirmed - a weak point in this research, I know. Other Kirk descendants also match a couple of the cousins with over 20 cMs. This whole comparison effort would be so much easier if there were tools to facilitate this research within the testing site (and I would love to paint these matches on DNA Painter!). It's always interesting to see how people use DNA to prove relationships successfully. My experience has been vastly different---I have over 10,000 matches on varying websites, and I cannot establish a real relationship with any of them except those I already knew about and used DNA to confirm. Good luck!! It can be incredibly rewarding when the pieces come together (and, of course, assuming I'm interpreting everything correctly!). I notice an interesting distinction between my parents' matches - my mother has hundreds more than my father (although not on the magnitude that you flag). I hope that the science will evolve or a tool will come down the pike to help folks like you confirm matches. Surely there's a market for it, you can't be the only one in need. I hope they do, Michael. It's just very hard with Ashkenazi Jews because we inbred for so long that we all share some DNA. For me, a match as small as you have hear would not be worth pursuing! But for those who are not cursed with endogamy, those results can be very telling. I've been interested in your Kirk "relationship issue" since your comment on my blog. I'm fascinated by the way you went about using the centimorgans. And I just discovered that my 3X great grandmother who has been a brick wall might be a sister of a bunch of DNA matches to a possible brother. Now I have a way to evaluate it. Thanks! I'm in Salt Lake City and was thinking of you today while I was at the Family History Library trawling through reels of microfilmed land records searching for the John and Margaret (Kirk) Beard who may or may not be related to my Thomas Kirk. There are definitely limitations to the research given the platform's lack of serious chromosome analysis tools, but it's a helpful indication of relationships that require closer scrutiny. Good luck and do let me know how it works out for you. I wish I had the patience to work on DNA connections. This is wonderful work. Thank you, Luanne. It can be time consuming, but when I find a match that advances my family history, it's time very well spent!